Sitting pretty in Edinburgh’s Georgian New Town, The Bellevue Residence is truly a sight for sore eyes. Stylishly decorated throughout, this apartment is the epitome of cool, calm and collected, and effortlessly combines traditional architecture with modern interiors. The well-appointed property sleeps up to four guests, and enjoys a private lower-ground level entrance. 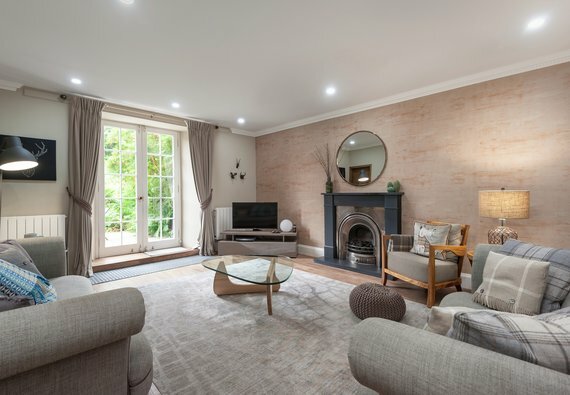 The light and airy living room provides the perfect space to sit back and relax after a long day exploring Edinburgh. French doors lead out to a leafy sanctuary with private patio and outdoor furniture, perfect for indulging in a G&T on a balmy evening. Back inside, and the contemporary decor includes sumptuous sofas, hand-picked artwork and large flat-screen smart TV with Netflix and Sky. Feeling peckish? Move through to the ultra-sleek kitchen and everything is on hand for your very own culinary adventure. The integrated Siemens appliances include an induction hob with telescopic hood, dishwasher, and double combination microwave ovens. A separate dining room is dressed with mid-century modern kitsch, and a great space for an intimate dinner. Two double bedrooms ensure a peaceful night’s rest and both benefit from plentiful guest storage. Luxury continues in the chic bathroom with shower over bath and underfloor heating, completing this simply wonderful home from home. The Bellevue Residence benefits from a fabulously central location in a residential Georgian street that perfectly demonstrates the New Town grand design. The location enjoys all the perks of city centre living, just a few minutes’ stroll from Boughton Street and Canonmills, both with great selections of independent shops, cafes and restaurants, as well as familiar brands. A large Tesco is just around the corner. The Dean Village and Stockbridge, two of Edinburgh's best loved areas, are less than a mile away and perfect for a lazy Sunday brunch or spot of people watching. Shopaholics are in luck as upmarket shopping street Multrees Walk – think Louis Vuitton and Harvey Nichols – is just a hop, skip and a jump away, as well as retail havens John Lewis, George Street and Princes Street. Sleeping arrangements Two double bedrooms. Exterior This is a lower-ground level apartment with private entrance, forming part of a traditional Georgian property. Interior layout A central hallways leads to two double bedrooms, kitchen, dining room, living room and family bathroom. No reviews yet for The Bellevue Terrace Residence.